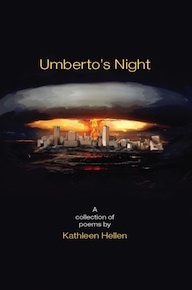 Kathleen Hellen is the author of Umberto’s Night (Washington Writers’ Publishing House, 2012), winner of the Jean Feldman Poetry Prize; and a chapbook, The Girl Who Loved Mothra (Finishing Line Press, 2010), published under the pseudonym Shiori (translated as “poem, weave”). Her poems have been published in American Letters & Commentary, Barrow Street, New Letters, Prairie Schooner, and Witness. Awards include poetry prizes from H.O.W. Journal and Washington Square Review, as well as The James Still Award and two Pushcart nominations in 2013. Her chapbook Pentimento is forthcoming from Finishing Line Press. Born in Tokyo, Japan, Hellen lives in Baltimore and teaches at Coppin State University.